Compilers: Principles, Techniques, and Tools is a computer science textbook by Alfred V. Aho, Monica S. Lam, Ravi Sethi, and Jeffrey D. Ullman about compiler construction. First published in 1986, it is widely regarded as the classic definitive compiler technology text. It is affectionately known as the Dragon Book to generations of computer scientists as its cover depicts a knight and a dragon in battle, a metaphor for conquering complexity. This name can also refer to Aho and Ullman's older Principles of Compiler Design. 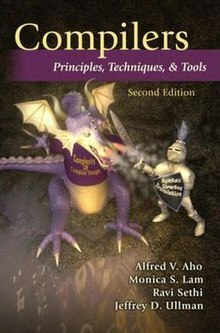 Following in the tradition of its two predecessors, the second edition (2006) features a dragon and a knight on its cover, and is informally known as the purple dragon. Monica S. Lam of Stanford University became a co-author with this edition. ^ "The Top 9 1/2 Books in a Hacker's Bookshelf". Retrieved 23 October 2010. ^ Alex Martelli; Anna Martelli Ravenscroft; David Ascher (2005). Python cookbook. O'Reilly Media, Inc. p. 587. ISBN 978-0-596-00797-3. Retrieved 21 October 2011. ^ Ian Stephenson (2005). Production rendering: design and implementation. Springer. p. 139. ISBN 978-1-85233-821-3. Retrieved 21 October 2011. ^ a b Mad Macz (January 2002). Internet Underground: The Way of the Hacker. PageFree Publishing, Inc. p. 219. ISBN 978-1-930252-53-0. Retrieved 21 October 2011. Sample chapters from the second edition.